Background and objectives Loop diuretics are commonly used to manage nondialysis-dependent CKD. Despite benefits of augmented urine output, loop diuretics are often discontinued after dialysis initiation. Here, we assessed the association of the early decision to continue loop diuretics at hemodialysis start with clinical outcomes during the first year of dialysis. Design, setting, participants, & measurements We considered all patients on in-center hemodialysis at a large dialysis organization (2006–2013) with Medicare Part A and D benefits who had an active supply of a loop diuretic at dialysis initiation (n=11,297). Active therapy was determined on the basis of whether loop diuretic prescription was refilled after dialysis initiation and within 30 days of exhaustion of prior supply. Patients were followed under an intention-to-treat paradigm for up to 12 months for rates of death, hospitalization, and intradialytic hypotension and mean monthly values of interdialytic weight gain, serum potassium, predialysis systolic BP, and ultrafiltration rates. Results We identified 5219 patients who refilled a loop diuretic and 6078 eligible controls who did not. After adjustments for patient mix and clinical differences, continuation of loop diuretics was associated with lower hospitalization (adjusted incidence rate ratio, 0.93; 95% confidence interval, 0.89 to 0.98) and intradialytic hypotension (adjusted incidence rate ratio, 0.95; 95% confidence interval, 0.92 to 0.99) rates, no difference in death rate (adjusted hazard ratio, 0.92; 95% confidence interval, 0.84 to 1.01), and lower interdialytic weight gain (P=0.03). Conclusions Continuation of loop diuretics after hemodialysis initiation was associated with lower rates of hospitalization and intradialytic hypotension as well as lower interdialytic weight gain, but there was no difference in mortality over the first year of dialysis. Diuretics are commonly prescribed for hypertension and volume management in nondialysis-dependent CKD. Currently, many clinicians in the United States discontinue these medications when individuals start dialysis. However, to our knowledge, there are no instructive data supporting this practice (1,2). Diuretics promote urine output and may offer many benefits, such as more consistent volume control and enhanced electrolyte excretion, to patients on dialysis who have some residual urine output (3). Enhanced volume control and sodium excretion can provide protection from the adverse consequences of fluid overload. Moreover, enhanced potassium excretion may allow individuals more dietary freedom, potentially allowing for better nutritional balance, greater protein intake, and prevention of protein energy wasting as well as improving quality of life. Among individuals with ESKD, loop diuretics are the most commonly used and potentially the most effective class of diuretics (1). Loop diuretic prescription among patients on dialysis is common in many other countries (1). Despite less robust use in the United States, there are some patients who continue loop diuretic use after dialysis initiation (2,4,5). This study examined the effects of continuing (versus discontinuing) the use of loop diuretics after initiating hemodialysis (HD). Data were derived from the electronic health records of a large dialysis organization in the United States and the US Renal Data System (USRDS). The following variables were abstracted from the electronic health records: demographics, comorbid conditions, laboratory values, dialysis treatment details, and episodes of intradialytic hypotension (defined below). The following variables were abstracted from that USRDS records: loop diuretic prescription refills, prevalence of nephrology care before dialysis initiation, death, and hospitalization. Eligible patients were those who, between the calendar years 2006 and 2013, were ≥18 years old, initiated three-times weekly in-center HD as first dialysis modality at the large dialysis organization’s facilities, were not US Veterans Affairs beneficiaries (contractual stipulation), had Medicare Part A and D benefits, and had an active supply of a loop diuretic (furosemide, bumetanide, or torsemide) at the time of HD initiation. A supplemental analysis considered only the subset of eligible patients with significant urine output, which was defined as the presence of a 24-hour urine sample with >200 ml collected at any time during the study period (1,6). This was a retrospective observational study of Medicare beneficiaries at a large dialysis organization in the United States. We conducted our observational study retrospectively using deidentified patient data; therefore, according to 45 Code of Federal Regulations Part 46 from the US Department of Health and Human Services, this study was exempt from institutional review board or ethics committee approval. We adhered to the Declaration of Helsinki, and informed consent was not required. The study was deemed exempt by an institutional review board (Quorum Institutional Review Board, Seattle, WA). This analysis represents an observational study approximation of a randomized withdrawal trial, and it is an example of a “treatment decision” or “new user” study design (7). Treatment decision study designs yield effect estimates that are relevant to common treatment decisions, because the study cohort is anchored at a time when a clinical decision is made, such as the discontinuation of a medication. The design also facilitates correct temporal ordering, with potential confounders ascertained before the index date, and it avoids inclusion of immortal person-time (Figure 1) (8). Study design. EHR, electronic health records; ICHD, in-center hemodialysis; IDH, intradialytic hypotension; IDWG, interdialytic weight gain; K+, potassium; SBP, systolic BP; UF, ultrafiltration; USRDS, US Renal Data System. For eligible patients, exposure was assigned on the basis of whether a loop diuretic prescription was refilled after HD initiation and within 30 days of exhaustion of the prior loop diuretic supply. Patients were followed for up to 12 months under intention-to-treat principles for rates of death, all-cause hospitalization, and intradialytic hypotension. For all-cause hospitalizations, both elective and unplanned hospitalizations were included and were not distinguished. Intradialytic hypotension was defined as nadir systolic BP <90 mm Hg for patients with predialysis systolic BP <160 mm Hg and nadir <100 mm Hg for patients with predialysis systolic BP ≥160 mm Hg (9). Mean monthly values of interdialytic weight gain, predialysis systolic BP, serum potassium concentrations, and ultrafiltration rates were assessed longitudinally. Patients were censored from the analysis in the event of death, receipt of kidney transplant, or transfer of care from the large dialysis organization. Baseline demographics and characteristics were considered as of the date of first dialysis, and they were summarized for each group as means, SDs, medians, interquartile ranges, and proportions as dictated by data type. Comparisons between exposure groups were made by calculating standardized differences. Variables were considered significantly different if the standardized difference exceeded ±10% (10). Crude incidence rates for death, hospitalization, and intradialytic hypotension were calculated by dividing the sum of events by the sum of cumulative at-risk time for each exposure group. Risk of death during follow-up was compared between those who continued loop diuretics and those who did not using a Cox proportional hazards model. Incidence rate ratios for hospitalization and intradialytic hypotension were estimated by negative binomial regression to account for overdispersion. Longitudinal predialysis systolic BP, interdialytic weight gain, serum potassium, and ultrafiltration rates were examined using mixed linear models with patient-level random intercepts. All outcome analyses were adjusted for variables that were found to be significantly imbalanced at baseline (age, vascular access type, and albumin) in addition to rates of diabetes and heart failure as comorbidities. The final models did not include adjustments for 24-hour urine volume <200 ml (standardized difference =19.6) or nephrology care before dialysis initiation (main analysis standardized difference =13.7; subanalysis standardized difference =18.2). The former was excluded due to its plausible role as an intermediate variable on the causal pathway (11). In the case of the latter, exploratory models were constructed with this adjustment, but the variable did not significantly contribute and therefore, was excluded to retain parsimony (Supplemental Table 1). We identified 11,297 patients who initiated HD while on a loop diuretic. Furosemide was the most commonly used loop diuretic (83% of patients) followed by bumetanide (9%) and toresmide (8%). Of these patients, 5219 patients continued loop diuretics immediately after dialysis initiation, and 6078 eligible controls did not (Figure 2). There were no differences observed in the type of loop diuretic used between patients continuing loop diuretics and control patients. Comparison of baseline characteristics indicated that patients continuing loop diuretics were younger, were more likely to have an arteriovenous fistula, and had higher serum albumin concentrations (Table 1). Study cohort. ICHD, in-center hemodialysis; LDO, large dialysis organization; USRDS, US Renal Data System; VA, Veterans Affairs. Clinical outcomes are presented in Figure 3 and Table 2. The death rate among patients continuing loop diuretics was lower (0.18 deaths per patient-year) compared with controls (0.23 deaths per patient-year), but it did not reach statistical significance (adjusted hazard ratio, 0.92; 95% confidence interval [95% CI], 0.84 to 1.01). 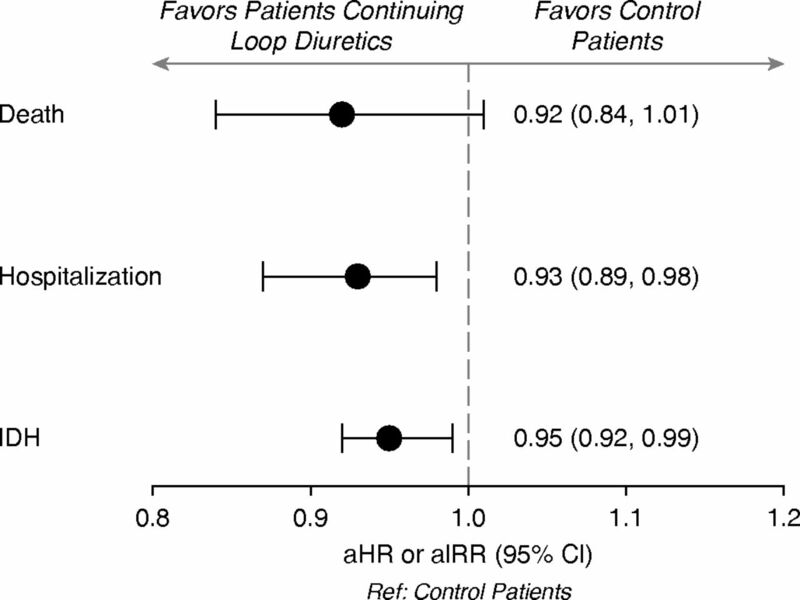 The all-cause hospitalization rate among patients continuing loop diuretics (1.84 admissions per patient-year) was significantly lower compared with controls (2.10 admissions per patient-year; adjusted incidence rate ratio [aIRR], 0.93; 95% CI, 0.89 to 0.98). Similarly, the rate of intradialytic hypotension was significantly lower among patients continuing loop diuretics (22.7 episodes per patient-year on HD) compared with controls (24.3 episodes per patient-year on HD; aIRR, 0.95; 95% CI, 0.92 to 0.99). Continuation of loop diuretics is associated with lower rates of hospitalization and intradialytic hypotension but not death. Plotted are the point estimates and 95% confidence bounds for each outcome adjusted for age, vascular access type, serum albumin, diabetes, and heart failure. aHR, adjusted hazard ratio; aIRR, adjusted incidence rate ratio; 95% CI, 95% confidence interval; IDH, intradialytic hypotension. Temporal trends in interdialytic weight gain, BP, and potassium levels are presented in Figure 4. Across follow-up, interdialytic weight gain was lower for patients continuing loop diuretics relative to controls (interaction P=0.03). No differences in predialysis systolic BP or serum potassium concentrations were observed during follow-up. Moreover, we did not observe a significant difference in mean monthly ultrafiltration rate during follow-up (Supplemental Figure 1) (interaction P=0.07). Interdialytic weight gain was lower for patients continuing loop diuretics but there were no differences in blood pressure or serum potassium across follow-up. Plotted are mean monthly values for each measurement adjusted for age, vascular access type, serum albumin, diabetes, and heart failure. Overall, patterns of association were similar in the subset of patients continuing loop diuretics and controls who had significant urine output as indicated by the presence of 24-hour urine samples with >200 ml collected at any time during the study period (1863 patients continuing loop diuretics and 2086 controls). Similar to the overall population, comparison of baseline characteristics indicated that patients continuing loop diuretics were younger, were more likely to have an arteriovenous fistula, and had higher serum albumin concentrations (Supplemental Table 2). There were no differences in death rates (adjusted hazard ratio, 0.88; 95% CI, 0.73 to 1.06), but a lower rate of hospitalization was observed among patients continuing loop diuretics (aIRR, 0.94; 95% CI, 0.89 to 0.99) compared with controls (Supplemental Tables 2 and 3). In contrast to the overall patient population, the rate of intradialytic hypotension was significantly higher among patients continuing loop diuretics (20.1 episodes per patient-year) compared with controls (19.8 episodes per patient-year; aIRR, 1.03; 95% CI, 1.02 to 1.05). No differences in interdialytic weight gain, predialysis systolic BP, serum potassium concentrations, or ultrafiltration rate were observed during follow-up. We found that, among patients who initiate in-center HD with an active loop diuretic prescription, 46% receive a loop diuretic prescription refill after dialysis initiation. A previous analysis of diuretic prescription among patients on in-center HD in the Dialysis Outcomes and Practice Patterns Study (DOPPS) found widely variable usage patterns worldwide (1). In general, patients in Europe and Japan were more likely to be prescribed diuretics relative to those in the United States; loops were the most commonly prescribed diuretic class in all geographic regions. Diuretic prescription in our study was more prevalent among incident patients than reported in the DOPPS diuretics study (46% versus 21%), most likely due to more reliable prescription information available within Medicare claims data. However, considering the results of both studies, it is clear that the majority of patients on in-center HD in the United States discontinue the use of diuretic medications after dialysis initiation. We found that, among patients on incident HD, continuation of loop diuretics after the start of dialysis was associated with a significant 7% lower risk for all-cause hospitalization after adjustment for health status. To our knowledge, this is the first study to make the important observation that continuing the use of diuretics after dialysis initiation may be associated with lower risk of hospitalization. Reducing hospital admissions may have many benefits. Compared with the general population, admission to the hospital puts patients on HD at higher risk for death (12). In this study, we observed a trend toward improved mortality for those who continued loop diuretics (8% reduction), but the finding did not reach statistical significance with our sample size. Hospitalization is also a major cost driver for patients on dialysis, accounting for approximately 33% of all ESKD-related Medicare costs in 2015, and it can have significant effects on patient quality of life (13). Thus, interventions that reduce hospital admissions for patients on dialysis may have many clinical and economic benefits. We also observed that continuation of loop diuretics was associated with a significant 5% relatively lower rate of intradialytic hypotension episodes and significantly lower mean monthly interdialytic weight gain. 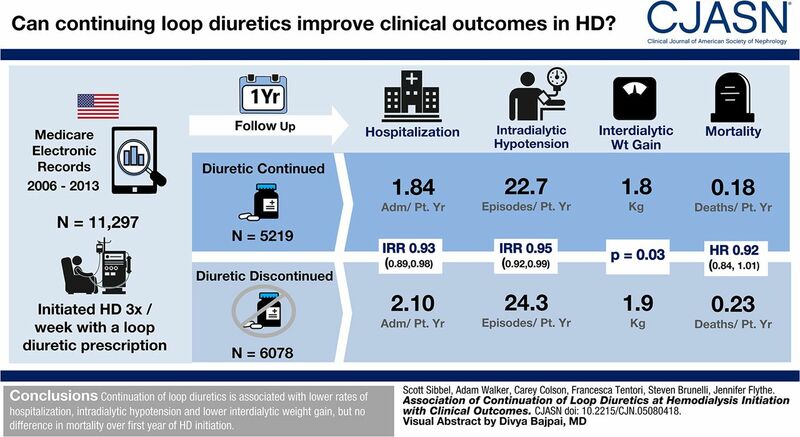 Overall, very similar observations were reported in the DOPPS analysis of diuretic use among patients on in-center HD. One notable difference is that the DOPPS analysis reported a 45% reduction in hypotensive events among diuretics users, whereas in this analysis, we observed only a 5% reduction (1). There are several differences in the design of the studies that could explain this difference. The DOPPS analysis included all diuretic types and was not restricted to United States patients. Thus, the greater reduction in hypotensive events observed in the DOPPS report could be the result of the effects of other classes of diuretics as well as differences in international prescription patterns, such as usage of higher doses, or international HD treatment practices. Furthermore and offering perhaps the most likely explanation for the discrepancy, the studies used different definitions of intradialytic hypotension, with the present study using a more strict, nadir-based definition (9). We repeated our analyses in the subset of patients in whom we were able to confirm some requisite urine output, because loop diuretics are most likely to be effective in these patients. Associations between continuation of loop diuretics and outcomes were similar to those observed in the overall study cohort. The one exception was that we observed that patients continuing loop diuretics in this subset were at significantly greater risk of intradialytic hypotension (3% increase) relative to their respective control patients. This discordant intradialytic hypotension finding may relate to overaggressive ultrafiltration and/or different intradialytic BP patterns in the setting of residual urine output. This finding may also be the result of a treatment by indication bias. It is possible that patients who are still producing urine but prone to intradialytic hypotension may be more likely to continue use of loop diuretics for related indications. Maintenance of residual kidney function (RKF) is associated with lower risk of death in both patients on in-center HD and patients on peritoneal dialysis (14–17). Furthermore, previous studies have linked RKF with lower levels of inflammatory markers, less erythropoietin-stimulating agent use, better quality of life, and better nutritional status (15,16). One possible explanation for the benefits that we observed is that continuing the use of loop diuretics promotes RKF. However, previous research indicates that loop diuretics increase urine output but do not increase clearance. For example, in a prospective study of patients on peritoneal dialysis, daily administration of a loop diuretic to patients resulted in greater 24-hour urine excretion but no differences in creatinine or urea clearance relative to those who did not receive a loop diuretic (5). Thus, improved outcomes observed in those using loop diuretics are most likely the result of more consistent volume regulation between dialysis sessions via sustained urine volume and are not due to preserved GFR. This hypothesis is supported by results from the Frequent Hemodialysis Network Daily Trial, in which HD six times per week was associated with improved left ventricular mass and predialysis systolic BP relative to conventional three times per week HD. These benefits are likely attributable to the approximately 1.2 L of extra fluid removed per week among patients dialyzing six times per week (18). Therefore, augmentation of daily urine output by 170 ml through the use of loop diuretics would be equivalent to the volume removed from three additional dialysis sessions per week. Despite the potential benefits of loop diuretic use among patients on dialysis, the potential side effects of these drugs should be acknowledged. At high doses, loop diuretics can cause ototoxicity. The incidence of ototoxicity is lower for oral versus intravenous dosing and typically reversed on cessation of the drug (19–21). Loop diuretics have also been linked to elevated parathyroid hormone levels in patients with CKD and patients without CKD, and they may carry the risk of causing additional kidney injury due to hypovolemic ischemia (3,22–25). However, patients on HD have frequent contact with health care providers and can be closely monitored for such side effects. Furthermore, the pharmacokinetic properties of the various loop diuretics should be considered. Furosemide, the most commonly used loop diuretic among patients in our study, is about 50% bioavailable after oral administration, with individual variability ranging from 10% to 100%, whereas bioavailability of bumetanide and torsemide is 80%, with much less variability. The t1/2 of furosemide is approximately 1.5–2 hours, which is extended in patients with kidney insufficiency due to clearance being mediated through kidney excretion. The t1/2 values of bumetanide and toresmide are 1 and 3–4 hours, respectively, which are unchanged in the context of kidney disease due to metabolism occurring within the liver (2,26). There are several limitations to this study. As a retrospective, observational study, the association between continuation of loop diuretics and outcomes can be measured, but cause and effect cannot be determined. Despite adjustments for imbalanced patient characteristics, the possibility of unmeasured confounding and associated bias remains. To have internal validity, we limited our study to patients with prior diuretic use and therefore, patients who most likely had some urine output. These results may not generalize to those who were not prescribed diuretics before dialysis initiation. Patients with significant urine output were identified on the basis of the presence of a 24-hour urine sample. It is possible that there were patients who were still producing significant amounts of urine but did not have a urine collection recorded in the data source during the study period; therefore, they may have been excluded from this subset. Finally, continuation of loop diuretic use was inferred from the observed prescription refills per an intention-to-treat paradigm, but the level of medication adherence cannot be determined. Continuation of loop diuretics after HD initiation was associated with lower risk of hospitalization, fewer episodes of intradialytic hypotension, and lower mean monthly interdialytic weight gain. Taken together, our results indicate that continuing to prescribe loop diuretics to patients after dialysis initiation could be an effective, low-cost strategy to individualize care of incident patients to improve outcomes. Clinicians should reconsider the practice of discontinuing loop diuretic use for patients on incident dialysis, and future prospective clinical trials should be performed to confirm these findings. S.S., A.G.W., C.C., F.T., and S.M.B. are employees of DaVita Clinical Research. Supplemental Table 1. Comparison of statistical results from primary and exploratory models. Supplemental Table 2. Baseline characteristics of control patients and patients continuing loop diuretics with significant urine output. Supplemental Table 3. Clinical outcome event rates among patients with significant urine output. Supplemental Figure 1. Longitudinal ultrafiltration rates were not different for patients continuing loop diuretics and control patients. Plotted are mean monthly values adjusted for age, vascular access type, serum albumin, diabetes, and heart failure. This study was funded by DaVita, Inc. and National Institutes of Health/National Institute of Diabetes and Digestive and Kidney Diseases grant K23 DK109401 (to J.F.). Portions of these results were presented in poster form at the American Society of Nephrology Kidney Week 2017 Meeting October 31–November 5, 2017 in New Orleans, Louisiana. Some of the data reported here were supplied by the US Renal Data System. The interpretation and reporting of these data are the responsibility of the authors and in no way should be seen as an official policy or interpretation of the US Government. See related editorial, “Diuretic use in incident ESKD: Are we out of the loop?,” on pages 13–15. This article contains the following supplemental material online at http://cjasn.asnjournals.org/lookup/suppl/doi:10.2215/CJN.05080418/-/DCSupplemental.